The Ibis Koh Samui Trophy brings the new, spectacular and fast growing sport of Adventure Racing to the South of Thailand. Supported by Ibis, The Tourism Authority of Thailand, the Tourism Association of Koh Samui and the Thai Hotel Association of Koh Samui, this inaugural Adventure Race is set to attract 150 teams from around the world. Scheduled for September 19 and part of the Amazing Thailand Adventure Race Series, the race will start and finish from the magnificent Bohput beach in front of the IBIS hotel in Bohput. Adventure Racing is a highly visual and dynamic sport genre, stretching competitors to their limits. It is a sport that is rapidly capturing the imagination of sports people in Thailand and around the world. The Koh Samui Trophy will offer 4 disciplines: Running, Cycling, Kayaking and Swimming. The competitors will hike and run through unspoiled jungle, paddle and swim on the turquoise waters of the Gulf of Thailand and cycle over the hills with spectacular views on the ocean. The final day of the Muay Thai competition at the inaugural Asian Martial Arts Games in Bangkok turned out to be a joyful day for Thailand, as the kingdom’s fighters won nine gold medals to elevate the hosts to the top of the medal standings. 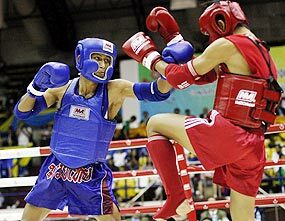 Competing at the Nimibutr Indoor Stadium, the Thai boxers underlined their supremacy in the sport by sweeping nine gold medals out of a total of 15 on offer. The first gold for Thailand came from 19-year-old Molthira Vatanapakdee with an impressive 5-0 victory over Hong Kong’s So Ming-wai jenny in the women’s light flyweight class. The men’s flyweight final saw Thailand’s Virapong Nonting resist an opening salvo from Laos’ fighter, Thongbang Zeuaphom, before unleashing a flurry of blows of his own to run out a clear 5-0 winner and deservedly take the gold medal. Countrywoman Kornnika Nuanboriboon saw off another Lao fighter, Paylor Xaypao, 5-0 to seize the gold medal in the women’s flyweight event. In the third round of the men’s bantamweight final, Sattra Paleenaram moved up a gear to launch a series of kicks to the body of his opponent, Noukhith, from Laos. These blows took effect in the following round as Laosaphao seemed reluctant to move closer than two-steps distance from the Thai, letting the time run out with no serious fighting in the final round and the gold being awarded to Paleenaram. Meanwhile in the woman’s bantamweight event, Prakaidao Pramari wrapped up the fifth gold medal of the day for Thailand with a whitewash 5-0 victory over Liu Jia from China. Kittisak Boonsemsen also kept the Thai flag flying high at the stadium with a gold medal in the men’s featherweight class after he trounced Vietnamese fighter Nguyen Tran duy-nhat, 5-0 in the final. In the women’s category, Thailand’s Sararat Kongsawang was a comfortable winner over Chen Qing of China with a 4-1 win to take the gold. The day was turning out to be the best so far of the championships for the hosts and it got even better when Weerapol Kwangkhwang stunned Zaidi Laruan from Philippines 5-0 to take the men’s lightweight title. The last gold medal in the ring arrived in the men’s light welterweight class when Sakdithat Sakdarat landed a hard blow to the right eyebrow of Zhang Xiaolong from China in the first round causing a deep cut and prompting the referee to the stop the contest and award the Thai fighter the gold medal. The 1st Asian Martial Arts Games in Bangkok, contested between 1st and 9th August, brought together some 1500 athletes from 40 countries competing in Muay Thai, Kickboxing, Kurash, Jujitsu, Judo, Taekwondo, Karate-do, Wushu & King fu, and Pecak Silat. Albany, NY (AP) - New York Giants quarterback Eli Manning has agreed to a six-year, $97 million contract extension, making him the NFL’s highest-paid player. A person close to the talks, speaking on condition of anonymity because the deal had not been signed or announced, said Manning will be paid about $15.3 million in annual salary to the end of the 2015 season. The deal means he will now be paid more than his older brother and Indianapolis Colts quarterback Peyton Manning, who receives an average $14.2 million annually, and Oakland Raiders cornerback Nnamdi Asomugha, who will get $15.1 million per year under his new three-year contract. Carolina defensive end Julius Peppers will make $16.7 million in the coming season - but it’s only a one-year deal. 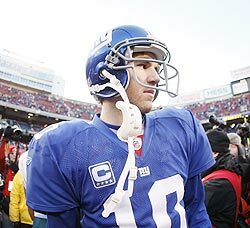 “He is a franchise quarterback,” Giants general manager Jerry Reese said last Wednesday. “He has done everything we asked him to do. He has come in, taken a lot of flack from you guys (the media) and he just keeps going. The New Orleans native, who took over as the Giants quarterback midway through his rookie season in 2004, has proven a worthy No. 1 overall draft pick. In his first four NFL seasons as the full-time starter, Manning has won a Super Bowl and was MVP of the game, helped his team to the playoffs all four years and is coming off his first Pro Bowl season. Reese said that a lucrative new contract would not put more pressure on Manning. Manning was in the final year of the contract he signed as a rookie in 2004 and will make $9.4 million under that deal this season. The two sides have been discussing a contract for months, but they worked out the final details last week. While Manning’s contract was to expire at the end of this season, there was little chance the Giants would lose him to free agency. They could have named him a franchise player and Manning has long said he wants to remain with the Giants. Last season, Manning threw 3,238 passing yards and 21 touchdowns. He also threw only 10 interceptions, 10 less than the previous season. Manning has started the last 71 games for New York, the third-longest streak among active quarterbacks at the end of last season. During that span he also has become the first Giants quarterback to throw for 3,000 yards and at least 20 touchdowns in four consecutive seasons. 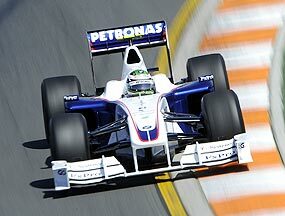 London (AP) - Peter Sauber made a failed rescue bid for the BMW Formula One ahead of the deadline for teams to commit to the world championship until 2012. Sauber, who retained a 20 percent stake after selling his Sauber team to BMW in 2005, said last Thursday he tried to take charge of the outfit again after the German car maker announced plans to pull out of motor sport’s premier series at the end of the season. Sauber said talks with BMW collapsed because the German automaker’s demands were “far too high.” Teams had to sign the new Concorde Agreement that governs F1 racing by last Wednesday. “I have been unable to sign the Concorde Agreement, which guarantees payments worth millions and would have secured the future of the team,” Sauber told Autosport. “I am incredibly disappointed and disconsolate. For me this is the bitterest day in my 40-year career in motor sport. It is also a devastating setback for the team. BMW motor sport director Mario Theissen insisted that “everything in our power to reach a rapid agreement” had been done. “Regrettably, despite every effort, this has proved unsuccessful,” Theissen said. “The tight timeframe we faced simply did not allow us and the interested parties and investors enough time to find a solution for such a complex transaction. The Formula One Teams Association said it will support plans for the team to sign up later if a buyer is found, providing the FIA governing body is also in agreement. Meanwhile, seven-time champion Michael Schumacher has completed two days of kart racing in Lonato, Italy, ahead of his return to F1 while Ferrari’s Felipe Massa recovers from the injuries he sustained at last month’s Hungarian Grand Prix. “Arms, upper body, shoulders, neck - an excellent practice indeed,” the 40-year-old Schumacher said on his Web site. Schumacher is not allowed to practice in the 2009 Ferrari car ahead of the European Grand Prix due to an F1 ban on in-season testing.